Rebecca Harris’ most recent exhibition, Understory, takes the gallery visitor on a journey through scenes and vistas of inviting, (but unnerving), forests, landscapes and vegetation. In these new works, Harris’ imagery is the story of the understory. Her practice has retained its focus on nature and landscapes and her technical abilities as a painter have undergone impressive artistic development, refining her vivid dreamscape of bright colours to teeter on the borderlines of reality. Fine details of flora and fauna are executed with delicate brushwork and purposeful sgraffito, (the careful scratching away of the top layer of paint). The foliage feels alive, tree trunks grow lichen and bark peels away, while meanwhile, in another part of the forest, copious varieties of flowers blossom. Harris’ moody landscapes are described from both a distance, incorporating vast skies, glass lakes and distance forests, and in the detail of their densely, towering greenery and cellular configurations of winding vines and delicate flowers, transforming into geometric patterns. The influence of Impressionist painting is stated and revealed in works such as Bankside with Monet’s Lilies. As anticipated, water-lilies feature in the work, but it is the visible application of layers of blue and pink paint, kindling a soft haze with the possibility of hope for sunshine that is prevalent and manifest in all the works in Understory. 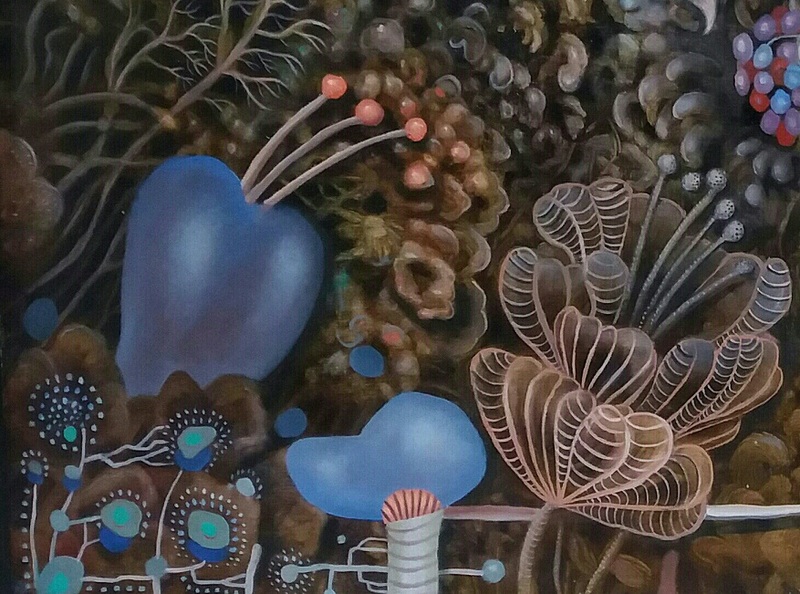 Keep on Going in this Spinning World features brightly coloured cellular plants, while Tapestry with Blue Mushroom is a crouching view into the leaf litter and fungi of the forest. A skull is hidden within the brown flora, and while this is an immediate reminder of inevitable death and decay fundamental to any ecosystem, the penetrating romanticism of Harris’ subjects makes this and other works far more than about their biology. While Harris’ flora and fauna is both fairytale beautiful and inviting, there is, like all good fairytales, a sense of danger lurking in the shadows. Original generation time 1.7590 seconds. Cache Loaded in: 0.0386 seconds.